After this year's seemingly interminable winter, nothing would be finer than getting outside to enjoy nature, especially if you can do so with your special someone. But week after week, you may find yourselves falling back into the Saturday night habit of drinks together at the local bar or watching Netflix on the couch. It's not that you want to spend all of your precious date nights indoors, but fun outdoor date activities are expensive! Maybe you and your beloved can't afford to go mountain biking, whale watching, or white water rafting. So you end up watching David Attenborough nature documentaries on Saturday nights instead. There's a reason stargazing is a classic romantic activity. Not only is it a free way to take in a breathtaking view, but it's an excellent excuse to snuggle with your sweetheart. Working together can make for a fun and meaningful date, which is why taking part in a nature scavenger hunt together can create lasting romantic memories. For such a scavenger hunt, all you need is a list of things to find while you are jaunting through your favorite scenic area. Since the rule for nature walks is "take only pictures and leave only footprints," all you have to do is check off that you saw each of the items on your list — or snap photos of them. For instance, you might challenge each other to find something that begins with every letter in the alphabet, in order. You could write down what you find (apple wood tree, beehive, coneflower, etc.) as you go. Similarly, you could challenge each other to find something representing every color of the rainbow. Plunging your hands into garden soil is a viscerally satisfying experience that you can share with your beloved. Planting, tending, and enjoying the fruits of your garden together can give you a lovely connection to each other and the earth. If you are early birds (or dedicated night owls), set your alarm for 0:dark-30 and watch the sunrise together. You can do this from the comfort of your own backyard, or make it an event by driving to the closest beach, park, or eastern-facing hill. As the night sky trades its blacks and grays for dawn's bright pinks and oranges, you and your date can cuddle together and enjoy some coffee and the quiet feeling of being the only people awake in the world. Finish your early morning date with breakfast al fresco, and you'll both spend the rest of the day with a smile on your faces. Even if neither of you can tell the difference between an eagle and an egret, going on a bird-watching adventure can be a fun date. Start with a quick search on the best birding areas near you. Audubon's official website offers a great deal of information and tips for new bird-watchers, and can give you some suggestions for local places to enjoy your bird-watching date. From there, you'll need a field guide — which you can borrow from the library — and a pair of binoculars. (If you don't have your own pair, borrow some from a friend.) Even with minimal equipment, you can start searching the skies and listening to bird calls together to see if you can identify various local species. Eating a delicious meal together will be much more fun if you can do it outside. And you don't have to go far or spend a lot to do it. Whip a meal in your kitchen, grab a blanket, and eat it in your backyard under the night sky with some candles lit around you. Or you could pack your meal in some Tupperware and head to your local beach or park. 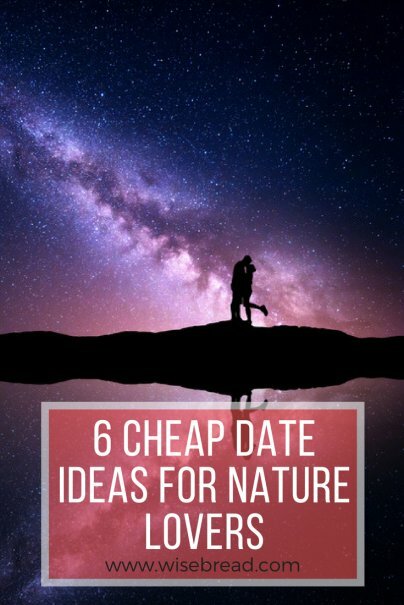 But even if you're stuck indoors — because sometimes the weather makes it impossible to get outside — you can still have a memorable date night together that honors your love for the natural world. Turn off all the lights, stow away and power down all of your electronics, and enjoy an evening of uninterrupted romantic connection. Not only will you be conserving energy, but you'll also get to enjoy the benefits of unplugging together.